Frederick BRIDGES 1882-1896: The Old Rectory Lodge. Shirley was rector of Hemingstone in Suffolk from 1798 when he agreed to succeed his uncle, the Rev'd Thomas Walsingham Western of Rivenhall Place, as rector of Rivenhall in 1820..'agreed', because he had left the area under a cloud many years earlier. He was to hold both parishes in plurality until his unexpected death at the rectory glebe-house in April 1824. He died unmarried and intestate. He was baptized at Rivenhall in 1768, the younger brother of the future Lord western and son of Frances & Charles Western of Rivenhall Place. Charles died in an accident when Shirley was only 3yrs old and was probably spoiled by his single parent mother. He went to Felsted School & graduated from Queens' College Cambridge with a B.A. in 1791. In that same year a Sarah Bridge of Rivenhall presented her illegitimate child called "Shirley" for baptism at Rivenhall. The child was a boy. Rector Shirley Western took his name from the family of Shirley and it would have been a rare thing in those days for a girl to he named Shirley. Charlotte Bronte popularised the name as a girl in "Shirley" in 1849 and, of course, the 20th Century produced Shirley Temple. Sarah Bridge seems to have been the love of Shirley Western's life but because she was of a lower class there was no likelihood of marriage. Sarah was found a husband in the shape of a John Ouilter, and married at Rivenhall in Feb. 1795 whilst Shirley Western, M.A. ,presented himself to the bishop of Norwich and was ordained in 1797. "Once more, enchanting girl, adieu! I must be gone, while yet I may. Put here I will not, cannot stay." "O say - but no, it must not be. Or never could I fly from you." The bell was probably paid for by the Westerns. The bell it replaced may have been cracked and recast or this 1823 bell may have been a new one. Used as the 5 min. bell before services, occasionally at weddings, and regularly at funerals -it was also used to give people working in the fields those times of day which were important to them.. Since Shirley Western's ministry it has been tolled by incoming rectors at the time of their institution to the living. Mrs Beryl Blackerby, who has lived in the village all her life, can remember the church caretaker taking her and a group of friends up into the church tower when she was 8 years old. She remembers how large it seemed to her and how beautiful the view was from the top, where they were able to wave to all those below. She remembers that the church bell was silent during the war For the last 20 years St Mary’s bell has also been silent - once again in need of repair. 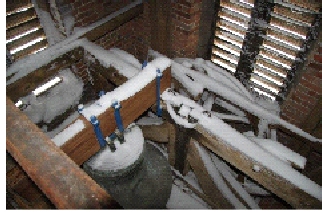 In 2009 Michael and Marie Galley decided to raise the money needed to enable the Bell to be rung again and having raised £4,500 for the necessary work this was completed during 2011 and the Bell was re-dedicated as Richards Bell in February 2012. The day bought heavy snow but the villagers rallied round and a full church were thrilled to hear the bell rung again. Intrepid Church Warden Oliver Clarke climbed to the bell and took the photograph opposite.